Size of the Industry Today India has 453 sugar mills those constituting 252 mills from the Co-operative sector and 134 Mills from the private sector. Output per annum India is the largest consumer of sugar and consumes around 16 million tonnes of sugar per annum. Sugar is made from sugarcane, and was discovered thousands of years ago in New Guinea. And then the route was traced to India and Southeast Asia. India was the first to begin with the production of sugar following the process of pressing sugarcane to extract juice and boil it to get crystals. The government of India in 1950-51 made serious industrial development plans and has set many targets for production and consumption of sugar. These plans by the government projected the license and installment capacity for the sugar industry in its Five Year Plans. India is well known as the original home of sugar and sugarcane. Indian mythology supports the fact it contains legends showing the origin of sugarcane. 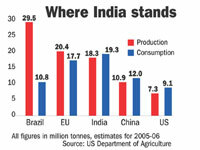 Today India is the second largest producer of sugarcane next to Brazil. Currently there are about 4 million hectares of land under sugarcane with an average yield of 70 tonnes per hectare. India is the largest producer of sugar including traditional cane sugar sweeteners, khandsari and Gur equivalent to 26 million tonnes raw value followed by Brazil in the second place at 18.5 million tonnes. Even in respect of white crystal sugar, India has ranked No.1 position in 7 out of last 10 years. The traditional sweeteners of India like Gur & Khandsari are consumed mostly by the rural population in the country. In the early 1930's nearly 2/3rd of sugarcane production was used for the production of alternate sweeteners like Gur & Khandsari. As accordingly because of the better standard of living and higher incomes, the sweetener demand has shifted to white sugar. Currently 1/3rd of sugarcane production is used by the Gur & Khandsari sectors. In the year 1930 there was an advent of modern sugar processing industry in India which was started with grant of tariff protection to the sugar industry. In the year 1930-31 the number of sugar mills increased from 30 to 135 and in the year 1935-36 production was increased from 1.20 lakh tonnes to 9.34 lakh tonnes under the dynamic leadership of the private sector. In the year 1950-51 the era of planning for industrial development began and Government laid down targets of sugar production and consumption, licensed and installed capacity, sugarcane production during each of the Five Year Plan periods. India is the largest sugar consumer and second largest producer of sugar in the world according to the USDA Foreign Agricultural Service. Indian Sugar Industry has total turnover of Rs. 500 billion per annum and contributes almost Rs. 22.5 billion to central and state exchequer as tax, cess, and excise duty every year according to the sources of Ministry of Food & Government of India. Sugar Industry is regarded second after the Textile Industry in India as per the agro-processing industry in the country. The industry currently has 453 operating sugar mills in different parts of the country. Indian sugar industry has always been a focal point for socio-economic development in the rural areas. Today nearly 50 million sugarcane farmers and a large number of agricultural laborers are involved in sugarcane cultivation and ancillary activities contributing to 7.5% of the rural population. Indian Sugar Industry generates power for its own requirement and even gets surplus power for export to the grid based on byproduct bagasse. There is even production of ethanol, an ecology friendly and renewable energy for blending with petrol. Sugar Companies have been established in large sugarcane growing states like Uttar Pradesh, Maharashtra, Karnataka, Gujarat, Tamil Nadu, and Andhra Pradesh and are the six states contributing more than 85% of total sugar production in the India. And 57% of total production is together contributed by Uttar Pradesh and Maharashtra. Indian sugar industry has been growing horizontally with large number of small sized sugar plants set up throughout India as opposed to the consolidation of capacity in the rest of the important sugar producing countries and sellers of sugar, where there is greater concentration on larger capacity of sugar plants. 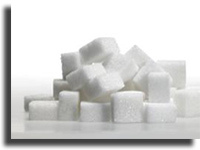 The Sugar industry In India has two sectors including organized and unorganized sector. The Sugar factories usually belong to the organized sector and those producers who produce traditional sweeteners fall into unorganized sector. Gur and khandsari are the traditional forms of sweeteners. Today India has 453 sugar mills, those constituting 252 mills from the Co-operative sector and 134 Mills from the private sector. And there are boosting 67 mills in the Public sector. As according to the statistics there is total number of 571 sugar factories in India as on March 31, 2005 compared to 138 during 1950-51. These 571 sugar mills have a production of total quantity of 19.2 million tonnes (MT). There is an increase in the Sugar production in India from 15.5 MT in 1998-99 to 20.1 MT in 2002-03. Jobs in Indian Sugar Industry has created ample employment opportunities in rural India. Today the Indian Sugar Industry has absorbed about 5 lakh rural people. The cultivation of sugarcane employs about 4.5 core farmers which is the first phase of the sugar production. Indian Sugar mills may be cooperatives, public or private enterprises. The industry today provides employment to about 2 million skilled/semi skilled workers and others mostly from the rural areas. People interested for Jobs in Sugar Industry should be a diploma holder in Mechanical or electrical engineering along with the diploma in the sugar technology. At the entry level one can expect a remuneration of Rs 6000-7000 per month and as with experience increases the pay may go up to Rs 6-15 lakh per annum. Sugar technologists are usually employed in sugar factories, alcoholic or non- alcoholic production plants or sugar research labs. The major recruiters in the sugar Industry are IFFCO and National Federation of Co-Operative Sugar Factories. The Indian Sugar Industry comes under the classification of "Red" which represents highly polluting industries. ISEC is successful in capturing new markets with strategic advantage like Srilanka, Pakistan, Russia, Indonesia etc. There is marvelous achievement for the first time, Indian white sugar was marketed by ISEC for direct consumption in Europe while in the past Indian sugar shipped to Europe was diverted to other destinations. In the year 2000, 10,000 MT was exported in containers for direct consumption in the European countries. 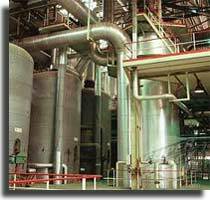 Government declared the new policy on August 20,1998 with regards to licenses for new factories, which shows that there will be no other sugar factory in a radius of 15 km. Setting up of Indian Institute of Sugar Technology at Kanpur is meant for improving efficiency in the industry. In the year 1982, the sugar development fund was set up with a view to avail loans for modernization of the industry.